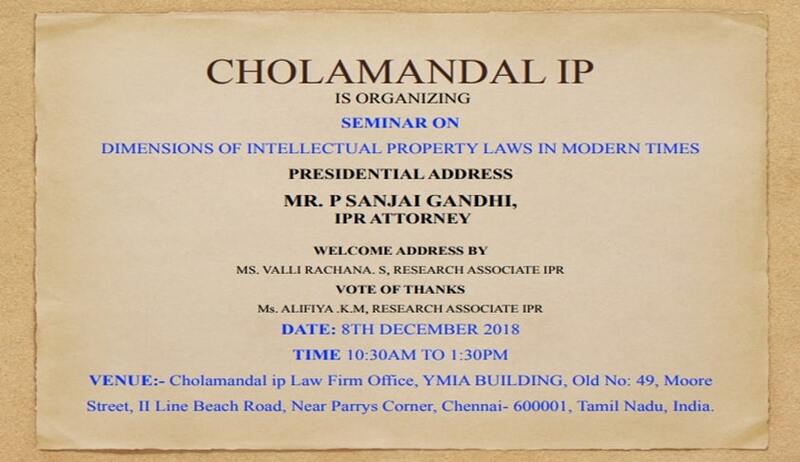 Cholamandal IP is organizing seminar on ‘Dimensions of Intellectual Property Laws in Modern Times’. Venue: Cholamandal IP Law Firm Office, YMIA BUILDING, Old No: 49, Moore Street, II Line Beach Road, Near Parrys Corner, Chennai- 600001, Tamil Nadu, India. The Presidential Address will be delivered by Mr. P Sanjai Gandhi, IPR attorney. The Welcome Address will be delivered by Ms. Valli Rachana. S, Research Associate, IPR. The detailed schedule and list of speakers can be accessed here.